What's your call on this one? Brad Marchand is yet again at the center of a controversy in the National Hockey League, following a questionable hit on Chicago Blackhawks forward Anthony Duclair. "If i had to guess, he tried to bring it over Duclair’s head. again, he’s gotta be in control of/responsible for his body, so it’s a suspendible play. i just dont think it was as malicious as everyone else seems to." "Maybe it was incidental contact, maybe it wasn't. But Brad Marchand long ago lost the benefit of the doubt on plays like that." "Duclair's right knee bent behind his body as he went to the ice after getting hit high by Marchand. That was the injury as he skated off the ice. Marchand whistled for interference. Hard to believe he's going to get the benefit of the doubt from the league on that one"
We reported earlier this week that the NHL is letting Marchand know that he’s being watched quite closely. On Friday, the league fined Marchand $2,000 for embellishment, for which he was penalized last week in a game against the Pittsburgh Penguins. It will be interesting to see what kind of punishment the department of player safety. What's your call? Do you believe he should be suspended for this hit? Boston Bruins' star forward Patrice Bergeron is still recovering from a fractured foot he suffered against the Toronto Maple Leafs, on Staurday, February 24. According to initial reports from the team's medical staff, the 32-year-old forward's condition was supposed to be evaluated in two weeks... Now just a few days before the actual evaluation, the news aren't exactly as good as we hoped they would be. 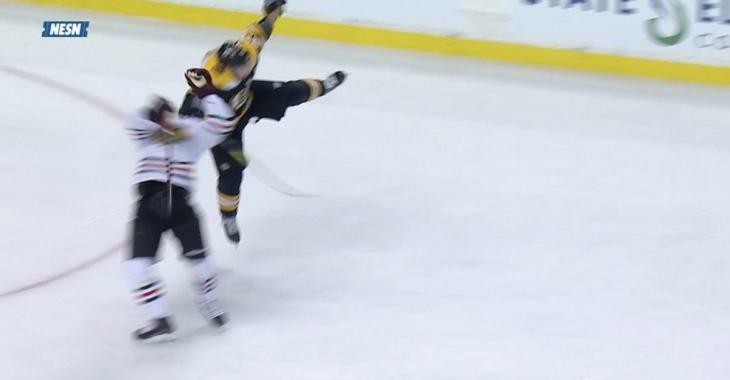 "Patrice Bergeron suffered his fractured foot two weeks ago to the day. It sounds like he’s not making the week-long road trip with the Bruins after today’s game, so his absence will obviously be going on longer." "Not a surprise to me. The wording was very vague in his injury update. They never put a real definitive time on when he would actually be back." After tomorrow's second back-to-back game against the Chicago Blackhawks, which will take place in Chicago, his team is set to face the Carolina Hurricanes on Tuesday, the surprising Florida Panthers on Thursday and the Tampa Bay Lightning, two days later. The Bruins' next game in Boston is scheduled on Monday, March 19 against the Columbus Blue Jackets. We sure hope he will come back soon, considering the 32-year-old centerman was one of the best players in the National Hockey League before he fractured his foot. He scored 54 points in just as many games this year, and helped the Bruins become one of the best teams in the league since the end of November. Bergeron was drafted 45th overall by the Bruins in 2003. He played a total of 953 career NHL games, in which he recorded 725 points. He also added 70 points in 101 playoff games.